Wild About Nature is a day-long event consisting of a series of talks, guided hikes, and trade show booths. It is put on by the Interpretive Guides Association (IGA) at the Canmore Nordic Centre. 1) A call for volunteers to staff the Calgary Outdoor Club's booth. If you are interested in volunteering, please sign up for Julie and Lorrie's event here. 2) This event, which consists of attendance at two sessions (one of which has a cost associated with it as it is guided), followed by an easy evening hike. Everyone will remain on the wait list for this event until you have e-mailed me (barbara.b (at) shaw.ca) confirming that you have followed the sign-up steps below). First to pay are first to be moved to the attendee list. 1) Register for the free "Presentation on the Cultural Knowledge of Plants" here. This lecture runs from 1:00-2:30pm at the Canmore Nordic Centre Meeting Room B. You will be asked to set up an account on the IGA website in order to register. 2) Register for the "Re-Wild Yourself Plant Walk" that runs from 3:00-5:00pm (do NOT sign up for the one from 10:00am-12:00pm) here. This is a guided hike let by Julie Walker, a local hiking guide and nature educator. Cost is $39.95 and this is payable directly to the IGA when you sign up. Payment is not handled by the COC. 3) Once you have received your registration confirmations for the above two, sign up at the bottom of this page and e-mail me (barbara.b (at) shaw.ca) to be moved to the attendee list. 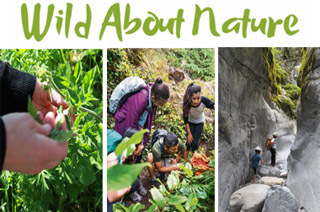 The plan is to make a day out of going to the Wild About Nature event in Canmore. We will carpool together from Calgary, and upon arriving at the Canmore Nordic Centre browse the trade show booths until it is time to attend our first session. I've wanted to learn more about edible plants in our area for some time, so the following events all support that. "Harvesting wild plants for food and medicine is a growing activity. Typically associated with Indigenous knowledge, harvesting is met with mixed feelings within our Indigenous communities specifically around teaching how to harvest wild plants for medicines. Harvesting is a complex interplay of knowledge, experience, practice and understanding because it is more than reciting the common or scientific names or reading about the various uses of a plant. The cultural knowledge of plants is the bases of a hiking series that is being developed where people begin to learn some of the cultural knowledge behind aspects of harvesting wild plants from an Indigenous framework." We will join "Julie Walker to discover the edible forest floor. Learn to safely identify 4 edible or medicinal plants of the Montane valley on this 2-hour walk. Discover the ancient relationship between animals, plants and early humans." We will find a place to have a bite to eat in Canmore. Alternatively we can have a potluck dinner. Let me know your preferences in the Notes when signing up. I love hikes that go off the beaten path and being out in the evenings, so before heading back to Calgary, we will go on an easy (<6km, <200m elevation gain) hike. This will be on the easy to low-moderate end and pace will be relaxed. Just bring a sense of adventure. Exact location to be chosen closer to the event date. Options include Grotto Canyon (where one can usually find glacier lilies), McGillivray Canyon, or the fallout shelter. If you know of any other more obscure areas you'd like to suggest, or if you have a request, let me know in the Notes field when you sign up. · $3 COC for Regular Members (bring exact change, payable at carpool). · You can also purchase a Premier membership the day of the event (bring $25 cash). 2) Guided "Re-wild Yourself Plant Walk" ($39.95, payable directly to the IGA when registering). Please bring exact change as drivers are not expected to carry change. Event Directions: Will be provided at carpool. Cost Includes: $3 is the COC event fee for Regular Members. Alternatively you may wish to get a $25 Premier membership, which is valid for 12 months from date of purchase; you can get this from your coordinator at carpool. Please bring exact change.